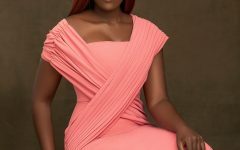 Nonye Adamu Creative Director of Noviannated & Noviann Interiors Released New Images to Celebrate Birthday! Nonye Adamu Creative Director of Noviannated and Noviann Interiors marked her birthday today November 3rd 2018. Nonye Adamu (Mrs) is the Creative Director behind the brand Noviannated & Noviann Interiors. She holds a degree in Business Administration and second degree in Management from Lagos State University. She is a certified diploma holder in Interior Design Concepts. Her work dates back several years ago as she has worked in oil and gas industry with Diamond Spur Limited, Slloyd Limited, Gaslink, First Marina Trust Limited in Lagos. She brings her wealth of experience to bear on the creativity, design and production management of her organisation. Over the years the brand Noviann have grown to be an household name in the fashion industry with award nominations and a win to show for it. Noviann as she’s fondly called is a strong advocate of women supporting women in business, women empowerment and women achievement programs.